September and October will be crucial in Pope Francis’ mission to church and world. He had earlier declared the first of September an annual day to pray for the care of creation. There are many such days, and in most local churches it will pass by largely unnoticed. But the naming of the day – and its reception – reveal much about the challenges facing the Pope as he marshals his resources to address environmental degradation, and about the style with which he does so. In his Encyclical letter, Laudato Si and elsewhere, Pope Francis has emphasised the urgency of the environmental crisis. It divides him from his critics who are less concerned about the risk to the world. His reflection on the causes of the crisis and on the extent of the change needed to address are also distinctive. He locates the root of the degradation of the environment in the association of technology with an economic ideology that lacks ethical direction. The environment then faces long term damage inflicted in the interests of short term profit. Because this ideology is so deeply rooted and so widely accepted, the change the Pope calls for in the way we human beings look at the world and ourselves is correspondingly great. We must see ourselves as part of the environment, and treat the natural world as a gift to be wondered at and respected. It is not to be exploited for gain. The correlative of this humane vision will be an economic framework that looks to the common good. This means that economic settings need to protect the vulnerable and the natural world in all its diversity. To address the environmental crisis will demand action by politicians. But they will also need a support from their people that can come only through a change of hearts and minds. In this mission the Pope is not preaching to the converted. Nor does his authority automatically commend the positions he takes. Encyclicals can be dismissed as passing events that represent the quirky vision of particular popes. Pope Francis wants the urgency and theological depth with which he addresses the environmental crisis to be reflected enduringly in the prayer and reflection of Christians. The day of prayer for care for the world is a very small tile in that mosaic. It will be a canary in the mine: the attention it receives will indicate the level of seriousness among Catholics about the environment. Its date is significant because it builds relationships with other churches. 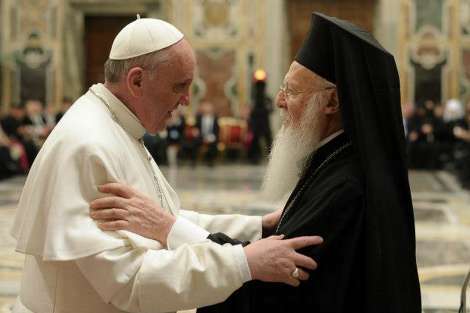 The pope has thrown the weight of his own church behind the Orthodox Ecumenical Patriarch Bartholomew, a prominent environmental advocate, who had previously consecrated the day to the Environment. Later in September Pope Francis will have the opportunity to commend care for the environment to the world. On 24 September he will address a Joint Sitting of the Houses of Congress in the United States. Among other topics, he can be expected to stress the urgency of addressing climate change. On the following day he will address the United Nations General Assembly, when he will again be able to draw attention to the environmental crisis and the need to respond to it. On October 4 - the feast of St Francis of Assisi, who inspires his concern for the natural world - he will celebrate the opening Mass for the Synod of Bishops, another event that will draw media attention. The Synod will discuss families, a topic on which Catholic conversation usually focuses on the spiritual and ethical aspects of personal relationships. But the welfare of families, too, is intimately bound up with a sustainable natural environment. Through his speeches and meetings Pope Francis will influence the atmosphere of very important December meeting in Paris on climate change. There governments will be expected to nominate a target by which they will reduce emissions, and to move towards a global agreement. The results of previous meetings have been disappointing because governments have been reluctant to pledge themselves to a binding target. The Pope’s contribution to the environmental crisis will not lie in technical solutions, but in his insistence on its urgency and in his conviction that care for the environment is a spiritual and a religious call. He encourages wonder at our world, respect in our dealings with it, and a way of life that embodies respect. Thank you, Father Andrew, for writing on this topic. I think the decision to decree a World Day of Prayer for the Care of Creation was significant for three reasons: (1) it was significant ecumenically, in the way the Pope aligned it with, and gave credit to, the Eastern Orthodox; (2) it was significant philosophically, because it effectively put the Pope’s money into his mouth after his encyclical, that he was serious about the challenge for Catholics; and (3) it was significant because it leaves reactionary Catholics no room to move other than to come out against the Pope and reveal that they are as cherry-picking and selective as any progressive they are opposed to. Not that the Pope is necessarily aiming his prayer day for reason (3); but it will have that effect. He is, however, effectively saying that Christian theology is not best served by a purely anthropocentric approach but that we have to develop a more holistic, universalist, mysterious one, if we are to shift from the idolatry of ourselves, our Church, our predilections to the worship of the Ineffable. Thanks again for another little gem. Prayers on September 1 may include some for Pope Francis who has spoken so bravely and with great vision in Laudato Si. I hope his American tour illuminates the global need for action for the poor and for our planet now. Thanks again Fr Andy Hamilton…I hope September one allows for us all to pray, to reflect and to act. "A canary in the mine"! Indeed Pope Francis has sounded both a warning and a challenge. A warning of the serious disconnect between the religion of the market place and the wide poverty of both spirit and access to this world's riches. The challenge is an immense one for the church. Identity with and care for the Earth is one issue that rings bells with young people seeking to find their place, their own identity in this world. Pope Francis has shone a bright light. This issue should be proclaimed from every pulpit around Australia. But is it? Thank you Andrew, yes, Francis practices the real christian message and values, and the fact that we find these unusual, is testament to how far we, the world's christians and a powerful institution have strayed. Colonialism and slavery are still influencing today's economic/political agenda. God;s creation,The world (mother earth) is not eternally inexhaustible.He is willing to stand with the poor not simply to be symbolic and saintly, honoured and perhaps deified, but as an example of every thought and action having the essence of true peace and justice. As the pope strips away the gilded and glamorous fortress of idolatry,urgently dragging the church into the present day he is an instrument of peace. Thank you for this article on the papal encyclical and day of prayer. It succinctly goes to the 'root of the degradation of the environment in the association of technology with an economic ideology that lacks ethical direction. The environment then faces long term damage inflicted in the interests of short term profit'. The article probably understates the need for our demands of governments for action which Francis virtually accuses of woeful negligence. But the assertion 'the environment is not to be exploited for gain' is probably a bit too absolute and should be qualified by reading with the following paragraph on 'an economic framework that looks to the common good' and 'economic settings need to protect the vulnerable and the natural world in all its diversity'. Laudato Si! A fortnight ago political conversation about asylum seekers had to do with turning back the boats, the links between terrorism and religious identity, exporting our Stop the Boats policy to Europe, the seductive dangers of compassion, and attempts to wedge other parties on the basis of their softness. Now it appears we have moved on, and for that Mr Abbott deserves our ungrudging gratitude, whatever side of politics we stand on.